The GoCart stow-and-go mobile storage rack is the perfect place to keep your GoCart mobile wheel jacks. Four dollies fit in this stand. This rugged tubular steel storage rack holds up to four GoCart auto carts. Simple pedestal mounting loads and unloads in seconds. Four swivel casters allow you to roll to the work area or out of the way for storage. Each dolly holds up to 680 kg., so a full set lifts a 2,722 kg. vehicle with ease. GoCart is perfect for low-profile sports cars, as well as higher-clearance trucks and SUVs. Confidently and safely move vehicles around your garage, even if they’re missing components (such as a working engine) necessary to make them run. One or two operators can easily roll a vehicle wherever you need it. When you’re finished moving those vehicles, you’ll have all four dollies back on the rack in just a couple of minutes. See how the GoCart storage rack integrates perfectly with the GoCart vehicle positioning jacks in the demo video below. The storage rack is the perfect complement to your GoCart dolly set. Operation procedures for the GoCart mobile car and truck jack could not be simpler. Just extend the telescoping GoCart to its maximum width, then roll the GoCart over to the vehicle, so the aluminium rollers "hug" the tyre. Twist close the valve and repeatedly step on the foot pump. The GoCart rollers will quickly and smoothly engage the tyre and prop up that quarter of the vehicle. Once you have reached the desired height, secure the pump mechanism into place and insert the connected pin into one of the GoCart's elevation locks. Do this for each desired wheel and you'll experience GoCart's easy rolling dolly perfection in no time. Since each dolly has two locking mechanisms, you and your vehicle are guaranteed safe passage anywhere you go. The dolly will never slip out of place during transit. 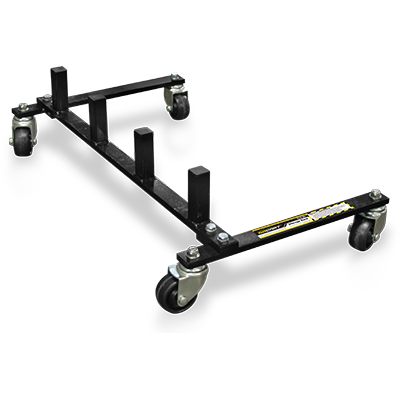 Once the vehicle is lowered, simply roll the dolly away from the wheel, lift it and set it in the rack. Durable, non-marring urethane casters ensure the storage rack is safe and easy to use.